‘I’m not sure I want to hear about those,’ said Paul. ‘I pencilled a guy,’ I said. Chris and Paul exchanged a look. ‘Most of the time he’s harmless,’ said Bert. ‘You put three men in hospital?’ said Paul. The setting is not Adelaide as we visitors might know it. This is not Arty Adelaide with gourmet food trails and quiet leafy streets. This is Adelaide with gang warfare between two drug lords (and a wannabe) and a swathe of sordid suburbs called the Badlands. And beyond that there is the barren desert that might have a gold deposit big enough to create the mining boom that South Australia never had. A mining boom to lift Adelaide out of its economic doldrums and give the indigenous owners of the land a real future. But the bloke who found the gold seam has been hammered to death (literally), and Westie and his mate Tasso don’t take long to make some very powerful enemies. Tasso is a very rich man in search of something fulfilling to do with his money; he employs Westie as the mining engineer he needs to do the paperwork and find the gold. As you’d expect with a billion dollar mining opportunity and a whole lot of people who find out what’s supposed to be a well-kept secret, there are many vested interests at work: an embittered ex-wife with a ferocious mother; the drug barons and their assorted thugs; a genial politician with a taste for fine wine and other rewards; and the canny indigenous owners of the land. And of course there’s a love interest who can’t help but add to the danger that Westie seems to thrive on. Fast-paced, well-plotted, and distinctively Australian in its style and preoccupations, Ecstasy Lake is seriously good fun to read. Internationally at major online stores, and also as an eBook. Check the links at Sarre’s website. Wow. I wouldn’t peg this as something you’d like, Lisa, it does sound rather “bloke-ish”! That’s the definition of a thriller, isn’t it? They call ’em ‘psychological thrillers when there’s no actual violence, and leave off the adjective when there’s a bit of biffo? 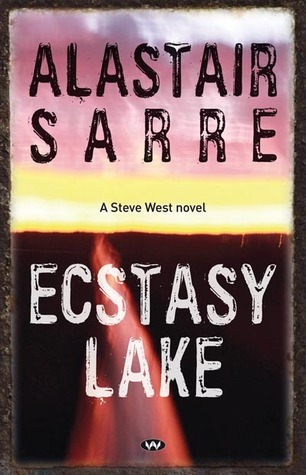 I think I like Sarre’s books because he weaves contemporary Oz politics into it (it was detention centres in the previous one), rather like Shane Moloney in his crime novels which I enjoyed until the joke wore thin. Or *musing* was that because we had a change of government?